(open daily from 10am – 5pm) is an Edwardian estate that was owned by Frederic Lubbock, becoming both a plantsman’s passion and a much-loved family home. 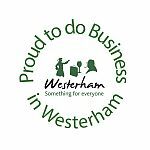 Listen on your smartphone to Westerham life in times past! has been installed in the Town on the wall of the Westerham Sports Association building on King George’s Field, Westerham to add to the one outside NISA. Sevenoaks District Council is working with Kent Wildlife Trust and local councils has secured funding from the Heritage Lottery Fund to develop a larger project proposal to encourage more people to enjoy the Commons and to improve them.